WE HAVE LOST OUT LEASE. WE ARE LOOKING FOR VACANT SPACE WE CAN OCCUPY. We have lost our lease. We are looking for a new location. Our Adoption and Education Center provides a new and better way for rescue groups and shelters to show animals in need of meeting members of the public and for the public to meet animals. Some animals cannot tolerate the noise and activity of a pet store, nor should they. Anyone who meets an animal in such an environment is not meeting the animal in a natural setting. At our Adoption and Education Center, the people are in cages and the dogs run around free. LOL. 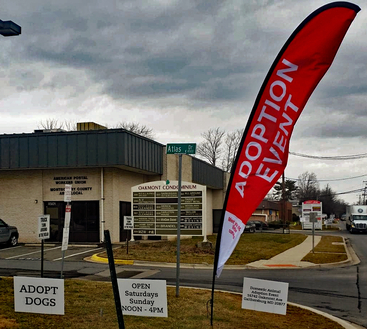 Monthly Adoption Shows: Adoption Main Show we are looking to have as many as 5 rescue groups on Saturday and or 5 rescue groups on Sunday from NOON to 4:00 PM. Ideally each group will bring between 2 and 5 dogs. Calling this an Adoption Show would not adequately describe this experience. We were definitely not standing around with a bunch of dogs on leash at a busy pet store. Our Adoption and Education Center allows dogs to be off-leash with other foster dogs and to freely interact with the public. For foster dogs that cannot be off-leash, there are fenced-in areas separated by privacy barriers. We can also accommodate cats on separate days. We may show dogs on Saturday and cats on Sundays. All animals attending will have their own webpage with basic information and your group’s application in the description. All animals attending will be listed on the Shows page. Member of the public can click on and request a meeting with an animal by providing their name and email address. Hours of operation: We are planning on being open every Saturday and Sunday and offer a space for YOUR FOSTERS TO BRING DOGS AND SHOW THEM away from their private home. YOU MAY USE THIS SPACE ANY TIME WE ARE OPEN. We will provide everything you need to show animals. ALL YOU HAVE TO DO IS REGISTER, PROVIDE BASIC DETAILS, AND SHOW UP WHEN YOU ARE SCHEDULED TO ATTEND. We will be open during week days and some weekend for tours. Future Shows: Click the link to our Events page to view all dates we are open and a description of the Shows. At this time, we are doing dog Shows. Animals attending an event: Click the Animals Attending link on the Events page to see animals registered to attend. Click on an animal to view its web page. Volunteering: There are many ways to volunteer! For example, you can help at an Adoption Show, make beds and blankets for homeless animals, attend Friday Movie Nights with foster dogs. See our Volunteer page for more information. Montgomery County students can earn Student Service Learning (SSL) community service hours for volunteering at the Adoption and Education Center. This facility has animals that may be reactive to new people. We have created this center to provide a more comfortable environment for these animals to meet the public. Some animals have gone through a stressful road to their new home and could bite, scratch or otherwise injure people. IF YOU ARE BRINGING CHILDREN TO THIS FACILITY IT IS YOUR RESPONSIBILITY TO WATCH YOUR CHILDREN AND KEEP THEM SAFE. No one, young or old, should approach any animal without first asking the animal's handler. During the Adoption Shows between NOON and 4PM you should NOT bring your own animal here. If you want your animal to meet an animal attending this event, please arrange before or after the Main Event. 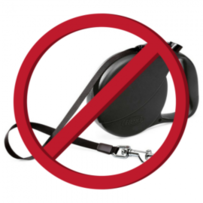 Absolutely NO RETRACTABLE leashes permitted on property or inside the building. A fixed leash no longer than 6 feet is recommended. In the movie “Field of Dreams” (1989), an Iowa corn farmer hears a voice telling him: "If you build it, he will come." He interprets this as an instruction to build a baseball diamond on his land. When he does, Shoeless Joe Jackson will come to play. THIS IS HALS FIELD OF DREAMS. HALS has built this Adoption Shows and Educational Center for you. We welcome rescue groups, shelters, and potential adopters who seek a better place to come together to find their next companion animal. Will you come? Consider this your personal invitation to be part of a new and exciting way to save homeless animals. This space has been transformed through hard work and donations. Indeed the space itself represents an extremely generous donation by Willco Company. Adoption Shows will primarily be for dogs and cats, but other small domestic animals will be welcome. These will include but not be limited to bunnies, ferrets, gerbils, and the like. Farm animals may be included in the future. Initially the center will be open one weekend per month. The center is prepared to host 5 rescue groups per day. The groups will have animals ready to meet and available for adoption to the public Saturday and Sunday from NOON to 4PM. From 10 AM to NOON and from 4PM to 6PM the center can be used by rescuers for private meetings providing quality quiet time for animals and adopters to bond, thereby, ensuring more successful adoptions. In the future, educational programs, especially those geared for children, are planned. Additional other practical and useful seminars for first-time dog owners and foster families are being developed. Please find it in your heart to contribute to this warehouse space, as we need extra funds to get the program up and running. Any donation amount is needed and greatly appreciated! Thank you Willco Company for donating the use of this space to hold Adoption and Educational Events. MATCHING DONATION,to help our animals. VERY GENEROUS!!! CONGRATULATIONS TO WASHINGTON CAPITALS FOR BRINGING LORD STANLEY'S CUP TO WASHINGTON! Thank you to Gaithersburg Party Rentals for discounting the cost rental needs so that we can save more animals! Thank you Tetze and Management. for providing DISCOUNTED, from their already reasonable prices, Leashes, Collars and Harnesses to our homeless dog. 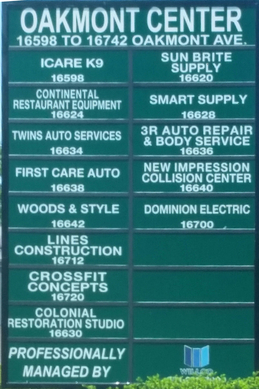 But look for the big green Oakmont Center sign below or click on photo of building on left. As you face this building we are on the right side all the way at the end. In order to register to bring animals to show, you must be a registered 501(3)c public charity and supply a copy of your IRS determination letter. 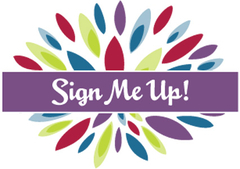 This form should be completed by a member of your board of directors or supply the contact information for the board member who has authorized participation in our show. Consider this your personal invitation to be part of a new and exciting way to show your homeless animals. This space has been transformed through hard work and donations. THIS SPACE IS FREE FOR RESCUE GROUPS TO USE. RESCUE GROUPS RESERVE YOUR SPACE TODAY!! To all those interested, take this 6 minute video tour. We continue to get ready to open. We lost the lease on this location. We are looking for vacant retail space where we can the the exposure we need to save many more animals. We are not closed we are just relocating!!! In an effort to find better ways for rescue groups show dogs in more friendly environment. and for prospective adopters to see available dogs from many groups at one time, HALS Adoption and Education Event Center will provide a quiet environment.